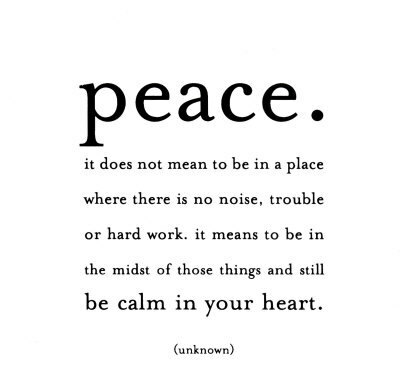 Signs And Symptoms Of Inner Peace | Live. Learn. Love. Eat. Tonight I thought that I would share with you what I read in Dr. Bernie S. Sigel’s book 101 exercises for the soul. I think that I may be coming down with some of these symptoms! I can definitely thank yoga for that. It always works magic on my body, mind and spirit. Today we spent the day in the city and bought our groceries, so I should have some delicious recipe posts coming soon. I am excited to try out some new breakfast ideas and I think this fall weather is putting ideas of baking in my mind. Going to the city always exhausts me, so after we got home I took a nice long walk with the girls. It is so gorgeous out these past few days! I am off to bed early tonight and hopefully tomorrow I will have something more to contribute. It truly is all about our hearts!! !